Despite the positive economic reports in the Great Britain and the poor reports from the US, GBPUSD chart has not had any special movement. 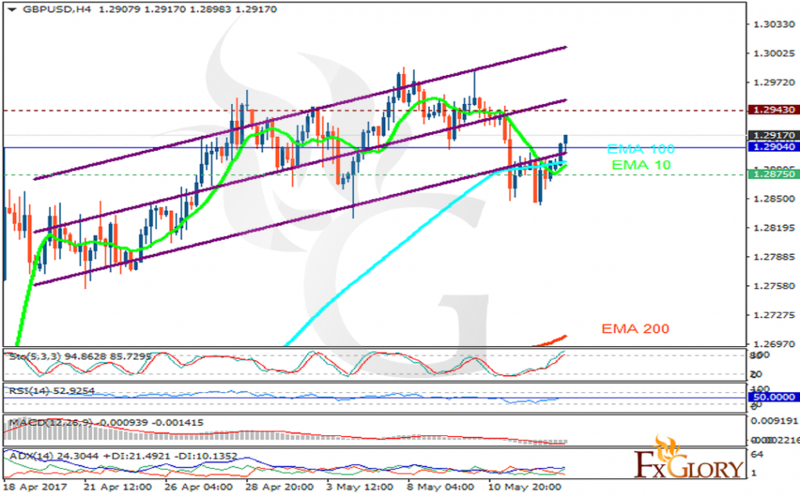 The support rests at 1.28750 with resistance at 1.29430 which the weekly pivot point at 1.29040 is located in between the lines. The EMA of 10 is moving with bullish bias along the ascendant channel and it is above the EMA of 200 and below the EMA of 100. The RSI is rising towards the 50 level, the Stochastic is showing upward momentum and MACD indicator is in negative territory. The ADX is showing buy signals. The resistance line seems to be too strong to be broken, therefore short positions are recommended for long tern trading targeting 1.2800.